In my time as a student the moments that made the greatest impact to my learning and the development of my love of learning was when I was set free to explore a topic of my choice. I was lucky enough to experience a learning environment in which the the question of "why did they build the pyramids?" was responded to with "I don't know, you should look it up". Off I would go to the library to pull out every book on the pyramids. This of course would lead to a multitude of additional questions, and before I knew it I was undertaking a giant self guided study of Ancient Egypt. Then I wanted to share my newfound knowledge with my fellow students, who challenged my information with new questions, "do you think the workers wanted to build the pyramids?" "maybe they were forced to because they didn't have any power?". Though oftentimes there were more questions than conclusions I was learning while engaged in respectful debate, discussion, and student-lead learning steaming from the natural curiosity and need to explore. Rather than looking to the authority of my teacher for definitive answers I learned to rely on myself to produce answers and ask questions. 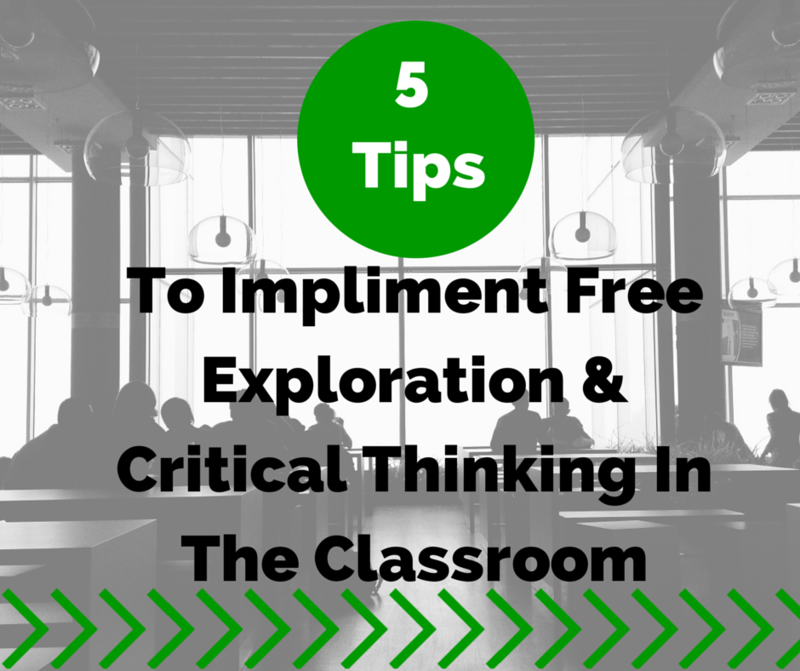 This is the type of free exploration that is unfortunately difficult to facilitate in an overcrowded traditional classroom setting, however it is not impossible. There is nothing better than giving students free time to explore the library. Before going you might want to have students make a list of three topics they are interested in, or a section they would like to explore (ie. trains, Canadian geography, or ancient China) so that they do not get overwhelmed by the variety of choice. Where possible, try to have students do research projects or writing on a topic of their selection. If they are interested in a subject because they chose it the quality of their work and the effort they will put into it will be greater. Try to find at least 45 min in your schedule one day a week. At the beginning of the month have students select any topic of their choosing that they would like to research. They must research the topic and create a poster, model, video, dramatic scene, story, or report about that subject to share with their classmates at the end of the month. Week #1: students select a topic and begin researching it (if possible during a computer lab or library time). Week #2: students finish their research and decide which format they would like to present it in. Week #3: students bring any necessary materials and create their presentation (ie. they make their poster, or write the script for a dramatic scene). Week #4: students present their creation to their classmates (give each student about 3 min to share their work). students can pick the presentation style that best fits the way they learn (ie. visual learners can create a poster about horses while active learners can write and perform a dramatic scene about the invention of the telephone). 4. Say "I don't know"
If a student comes to you with a question, and time permits their exploration, respond with "I don't know". The first few times you do this you might get blank stares or shocked looks from students. Prompt them into self guided learning by suggesting that they ask the class to see if they know, or that they should look it up. This provides students with the valuable opportunity to see their learning as something they have control over and can self-source. Don't underestimate the contributions of students. Instead of launching straight into a traditional lesson begin with a question, or a 'what I know vs. what I don't know' schema about a topic. As students contribute their information write it on the board in a giant 'brainstorming' format. When a student asks a question, first ask the rest of the class before contributing the knowledge you are working to present in the lesson. Have them throw out hypothesis, questions, and debate with one another, look up information online, in the textbook, or using reference books. Guide the conversation but take the backseat while writing down what students say. Near the end of the lesson as questions wane and the information you sought to cover is presented, make a summary of the schema you created with students. Highlight the main points, and have them reflect on the process. This is a great way to introduce a unit or a particular subject.